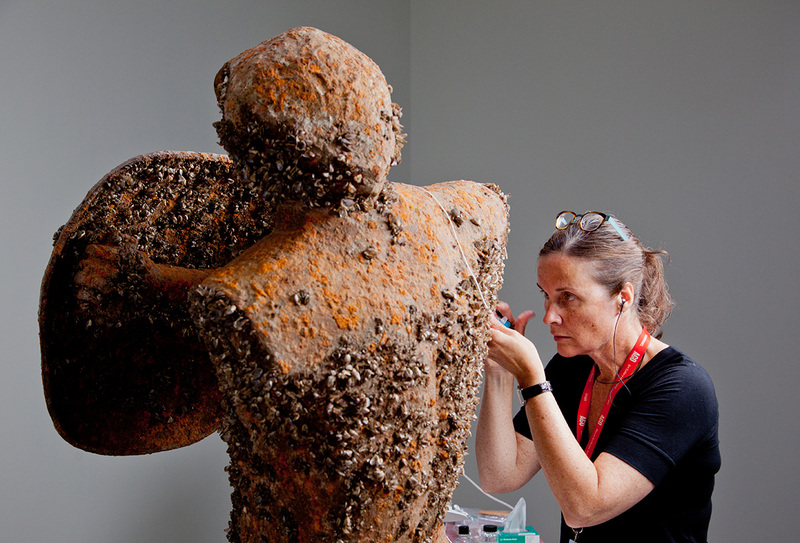 Contemporary art conservator Sherry Phillips at work on Simon Starling’s Infestation Piece (Musselled Moore). Courtesy the Art Gallery of Ontario, Toronto. Photos: Dean Tomlinson. 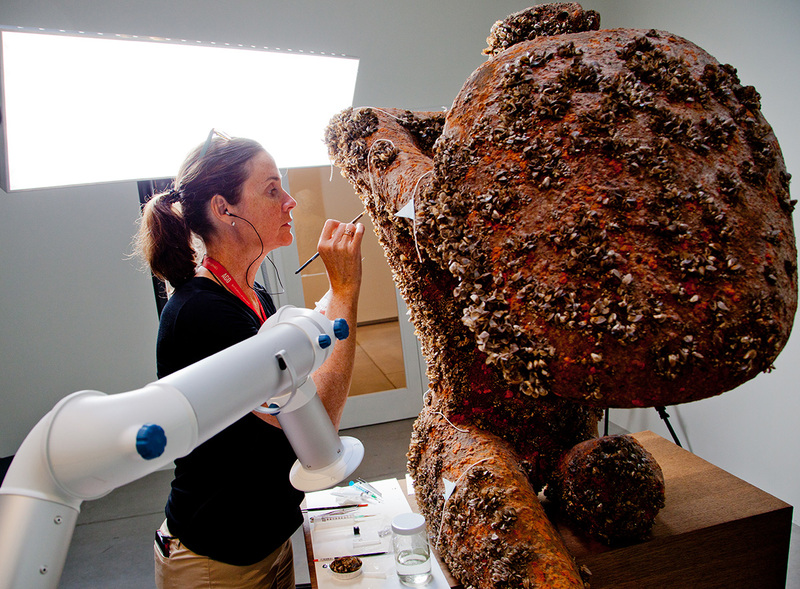 Contemporary art conservator Sherry Phillips at work on Simon Starling’s Infestation Piece (Musselled Moore). Courtesy the Art Gallery of Ontario, Toronto. Photos: Dean Tomlinson. 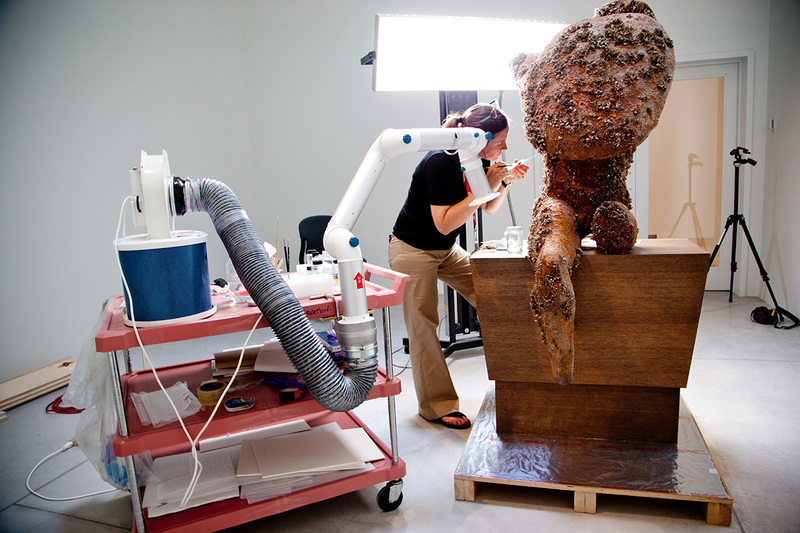 Contemporary art conservator Sherry Phillips at work on Simon Starling’s Infestation Piece (Musselled Moore). Courtesy the Art Gallery of Ontario, Toronto. Photos: Dean Tomlinson. For someone who claims to work behind the scenes at the Art Gallery of Ontario, art conservator Sherry Phillips has become a familiar face to visitors over past few years. 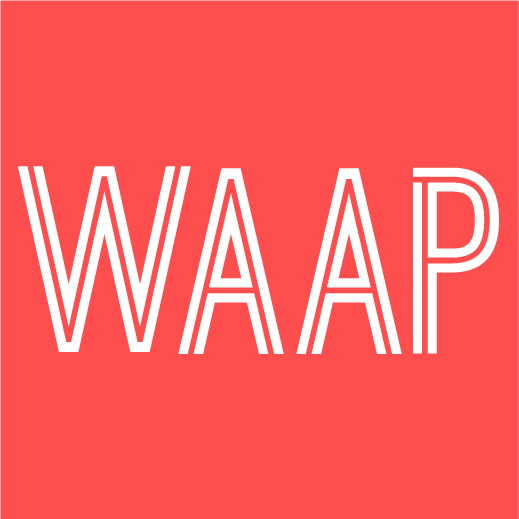 In 2013, the AGO decided to put its art conservation and restoration efforts on public display. Phillips and her team occupied a space opposite the Henry Moore Galleries where they spent four months providing much-needed TLC to one of the AGO’s most popular works, Floor Burger (1962) by Claes Oldenburg, before it went on display in a retrospective of the American Pop artist’s early sculptures at New York’s Museum of Modern Art. The public could ask Phillips and the other conservators questions about the process of returning “the burger” to a displayable condition, which included many hours of carefully re-affixing flaking paint onto the sculpture’s canvas buns with adhesive. Earlier this year, Phillips started another painstaking project – the conservation of British artist Simon Starling’s Infestation Piece (Musselled Moore). Commissioned in 2006 for a 2008 solo exhibition at The Power Plant, the bronze sculpture, a replica of a Henry Moore sculpture titled Warrior with Shield (1954) in the AGO’s collection, was submerged in Lake Ontario for over a year. Its surface became populated by zebra mussels. Like much of Starling’s work, the piece brings together art history and the natural world to examine humanity’s role in changes occurring in social, political and natural systems. One would think that a conservator’s work consists mainly of the manual labour it takes to repair the damage caused to art by mishandling or the passage of time. Not so, especially with artworks consisting of unconventional materials. Before starting work on conserving the Starling piece, Phillips had to conduct a lot of research. “I know way more about zebra mussels and byssus than I ever thought I would,” she chuckles. With restoration, the conservator may add materials to return an object back to a former state. At present, Phillips is not replacing the mussels that fell off with new ones; she is using a special adhesive to keep the existing mussels in place, or is carefully reattaching mussels that had come off wherever there are pieces of byssus on the surface, an indication that a mussel had once been in that spot. Once the security of the existing shells’ attachment is improved, she will work under Starling’s instruction to add shells to ‘restore’ the intended appearance. Hear Phillips and Simon Starling explain more about the AGO’s conservation of the sculpture in this video from the gallery’s Conservation Notes series.